I have to admit I found this issue mildly confusing. I really loved Moon Knight’s scenes from Shadowland #2. In fact, I thought they were the best of the whole issue. While this first issue of Moon Knight’s own tie-in does take us right up his smashing up his own cab scene, it’s also about a lot of other things. The elements that directly relate to what’s going on in Shadowland seem like they’re part of a subplot, like this series being a Shadowland tie-in is an alibi for the writer to tell a story that, at least thus far, seems to be primarily about something else. I must say that I found that a little disappointing. Having said that, it’s not at all a bad story and I must applaud Gregg Hurwitz’s skills at characterization and subtly introducing readers unfamiliar with Moon Knight to the character and his world. The way Daredevil and his reign tie into the larger plot is unexpected, to say the least. We learn here that Matt summons a man, the central villain of the story, to bring him Moon Knight. We don’t quite get why Daredevil wants this, and this is not what ultimately causes Moonie to drive his cab into Hell’s Kitchen. 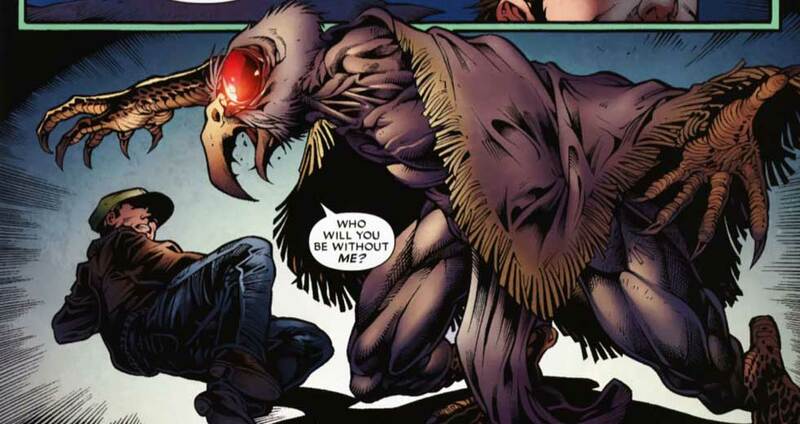 Either way, the man that has come to take orders from DD appears to be an agent of Konshu and he decides to draw Moon Knight out by finding someone else to act as Konshu’s avatar. The man he finds to fill this role has a strange Cyclops-like power and is sufficiently mentally unstable to go for the job right away. This sets up the second threat against Moon Knight and his loved ones, aside from his being captured and jailed. I’m not sure where Hurwitz is going with these two seemingly parallel storylines. It might work out great, but for the moment, I’m a little puzzled by all this. The art work by Bong Dazo is generally quite nice, but I’m no fan of the hyper-accentuated muscle definition he gives Moon Knight, making him look like one of those old He-Man action fictures I remember from my childhood. He also draws an absolutely horrid Daredevil. Matt in his black costume looks like a Chesterfield armchair covered in latex. These examples aside, I have no complaints though. Let’s hope this comes together a little more next issue. This is a story with potential, but right now it feels like it’s trying to tell one story too many. Yes, indeed, I think we have yet to see what Daredevil’s interest in Moon Knight is, exactly. But for someone who is a Moon Knight fan, like me, and has been following Marc Spector’s (or one of his multiple names) ascent fromt he shadow of Konshu, this issue was very exciting. So far, I think this is easily the least accessible tie-in. If you weren’t reading “Vengeance of the Moon Knight”, this stuff is confusing. I tried out that book when it was relaunched, but dropped it after several issues: it was fine, but just didn’t capture me. But, I do know that the inner struggle between Marc/Jake/Stephen and Khonshu was an ongoing story there. 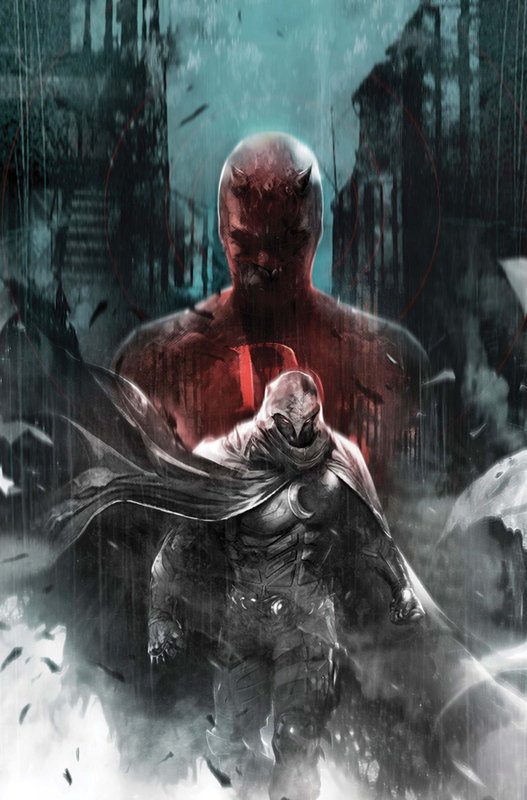 The fact that “Vengeance of the Moon Knight” is on indefinite hiatus leads me to believe that perhaps Hurwitz et al. decided to wrap up their unresolved stories in this tie-in series.